Exhibition / Event supplements, New Year, Xmas, Islamic Holiday supplements. Arrival at Dubai airport. Meet & Greet by our representative at the exit gate. 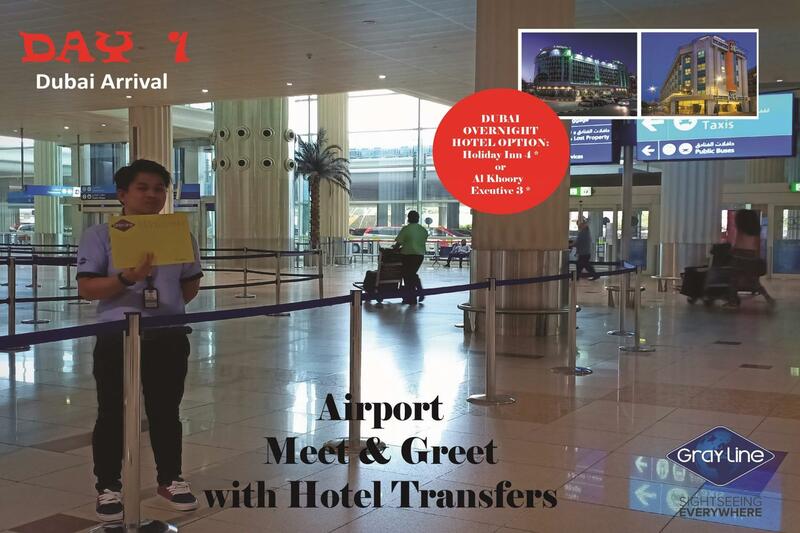 Transfer to your hotel by air conditioned vehicle. Check in & Overnight in Dubai. Breakfast at your hotel. Departure to discover the spectacular and lively metropolis of Dubai. Dubai, developed from a small fishing village at the Dubai Creek, nowadays presents itself as a glamorous metropolis in the Arabian Gulf. The distinctive skyscrapers and gigantic shopping-malls will impress every visitor. 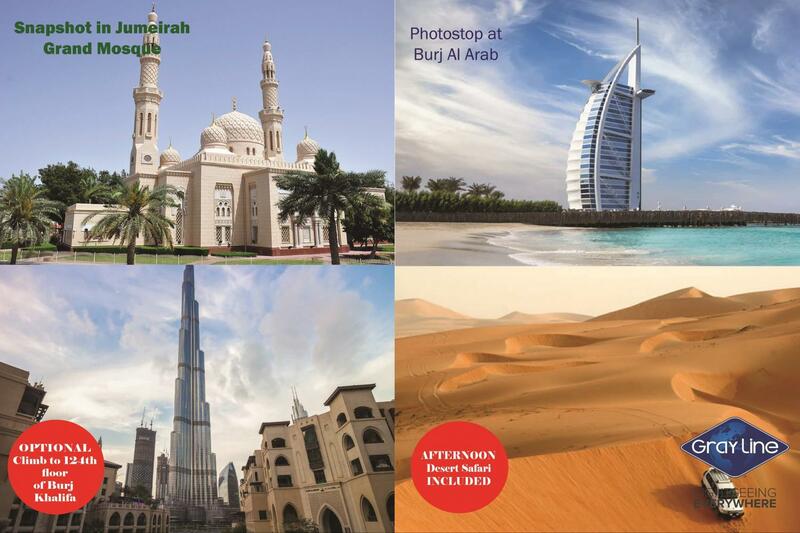 On your way you will photo stop of the awe-inspiring Grand Mosque of Jumeirah. Photo stop of Burj Al Arab hotel. 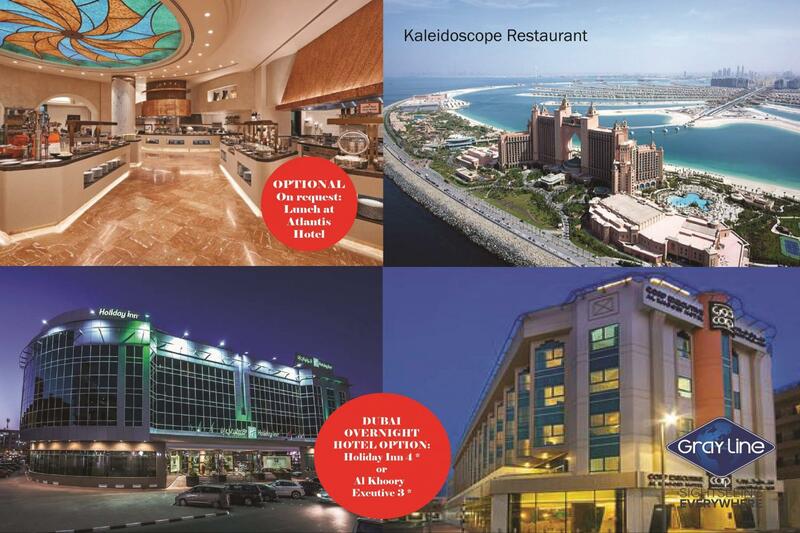 Photo stop of the Atlantis hotel located at crescent of Palm Jumeirah. Pass by the new residential area of Jumeirah Beach. Pass by the region of DUBAI Mall and Burj Khalifa, the world's tallest tower and the centerpiece of the Gulf region's most prestigious urban development to date. Burj Khalifa will radiate out in a series of ellipses from the sky breaking tower encompassing residential, commercial, hotel, entertainment and the world's largest shopping mall. Then you will continue to Bastakyia, the old town district of Dubai. Learn everything about the local history and geography of the city when visiting the Dubai museum, located in the ancient fortress of Al-Fahidi. Another highlight will follow: you will use the local water taxis, called “Abras”, to cross the Dubai Creek. Enjoy the spectacular view of the city while heading towards the district of Deira. Here you will be enchanted by the large variety of exotic spices in the famous Spice Souk. Take the chance to get a unique and affordable souvenir when you visit the adjacent Gold Souk .Before lunch,, we will propose to climb to the Burj Khalifa (optional) at the DUBAI Mall site.Lunch will be served. In the afternoon we will join for a Desert Safari, after settling down in the 4WD vehicles, the jeeps will speed through the desert of the golden sand dunes. The dune bashing or desert driving continues with the thrill of going up and down the dunes provoking many shrieks and laughter full of excitement. The final leg of this program takes us to the main camp site. This will definitely be the highlight of the trip. After witnessing a memorable sight – the true Arabian sunset with its glory and magic. A delicious Barbecue Dinner is prepared on open fires and a variety of beverages are available. The beat of the music increases as a Belly dancer starts dancing to the rhythm of the music. What a better way to experience a true Arabian night than this. Overnight in Dubai. Breakfast at your hotel. In the morning, you will have opportunity to explore the shopping in Dubai. Visit Dubai Mall before you head towards Sharjah. After a three hours of shopping, we will proceed to Sharjah well known as “cultural capital of the Emirates”.Lunch in Sharjah. You will visit the Sharjah's Museum of Islamic Civilization, the first of its kind in the UAE. Opened in 1987 as the Souq al-Majarrah and quickly became a popular landmark. Its most outstanding feature is its majestic, gilt central dome, decorated on the inside with an intricate mosaic depicting the night sky and the signs of the zodiac. After a quick stroll in the museum, we will further proceed to the East coast of UAE. On our way, we pass through the agricultural area of Al Dhaid. 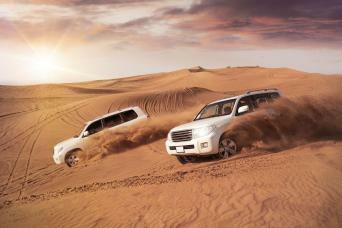 The terrain changes from colorful desert landscape to spectacular mountain scenery. 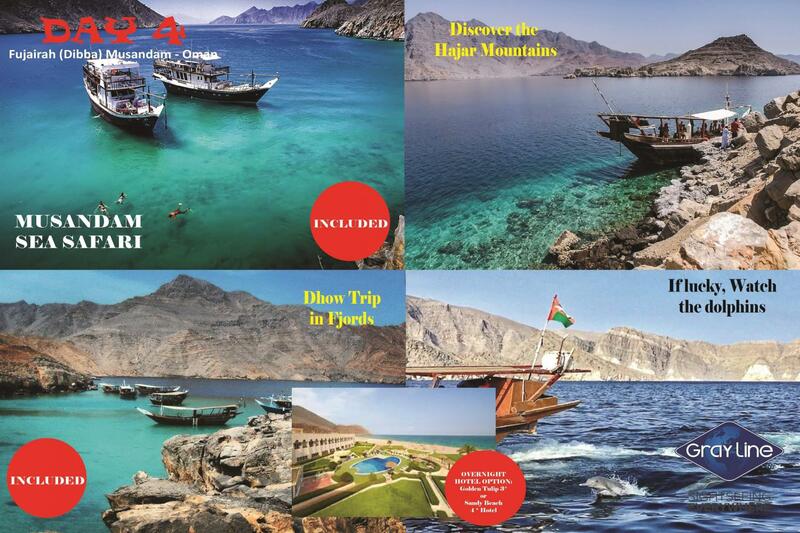 The coastline is scattered with small fishing villages, including the old village of Dibba, once a strategically important settlement, with a stunning view across the Indian Ocean. Continuing along the coastline, we arrive at the oldest mosque in the country. The Al Badiya Mosque was built in the 17th century. 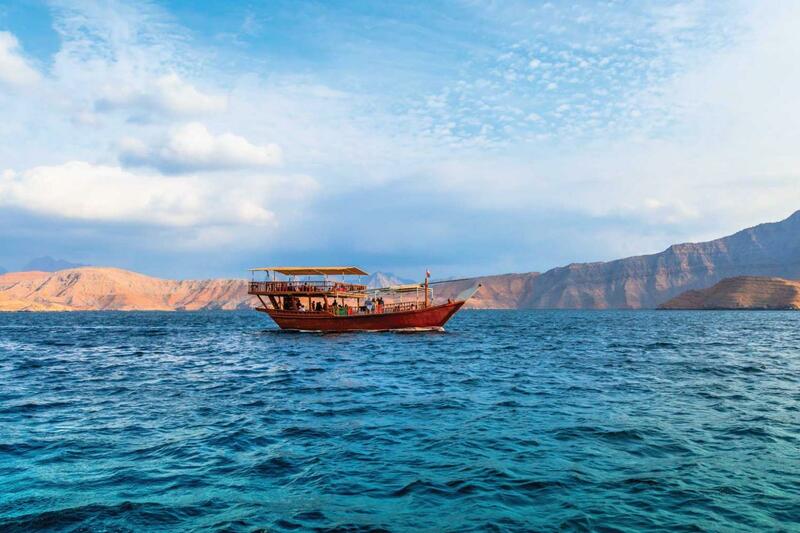 .You just have reached the warm coasts of the Indian Ocean and the Gulf of OMAN. Check in. Dinner at the hotel & overnight. Back at the end of the day to relax at your Hotel. Dinner in hotel & overnight in Fujairah/Dibba. Breakfast at your hotel. 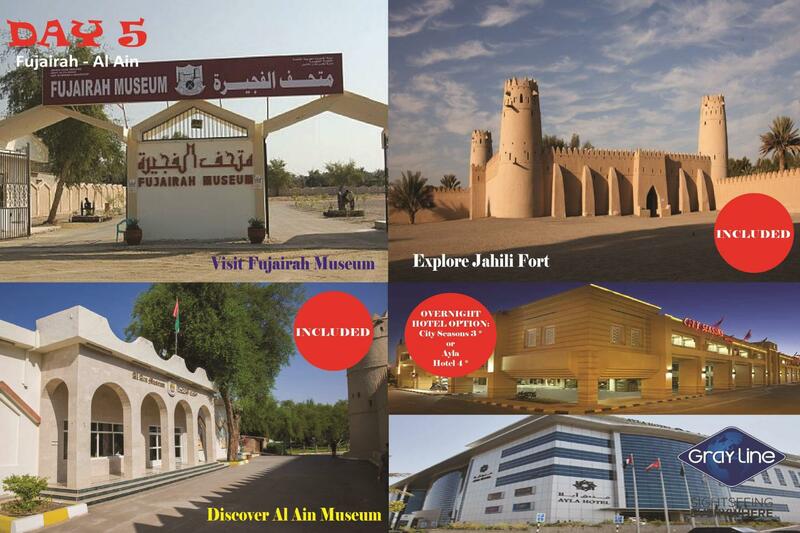 Before we proceed to Al Ain, we will have a quick city tour of Fujairah, visiting Fujairah Museum We will arrive to the oasis city of Al Ain. Lunch in a local restaurant. Just after lunch proceed with the tour of AL AIN, the green city, located on the Hajjar Mountains. Al Ain is one of the oldest cities in the UAE, rich in traditions. For thousands of years the oasis of Al Ain has been an important caravan stop on the ancient trade routes across Arabia. You will visit the camel market, the largest in the UAE. Visit of the Jahili fort, one of the largest castles in Al Ain and best-in-class example of the Islamic military architecture locally. After that will proceed to visit the National Museum of Al Ain, where you will learn everything about the history of this region. Then will step back in time at the Hilli Gardens, famous for its archaeological excavations from the third millennium B.C. Transfer to the hotel and check in late in the afternoon. Dinner in hotel & overnight in Al Ain. Breakfast at your hotel. After a last tour of AL AIN, we will depart to Abu Dhabi, the largest and the capital city of the United Arab Emirates. 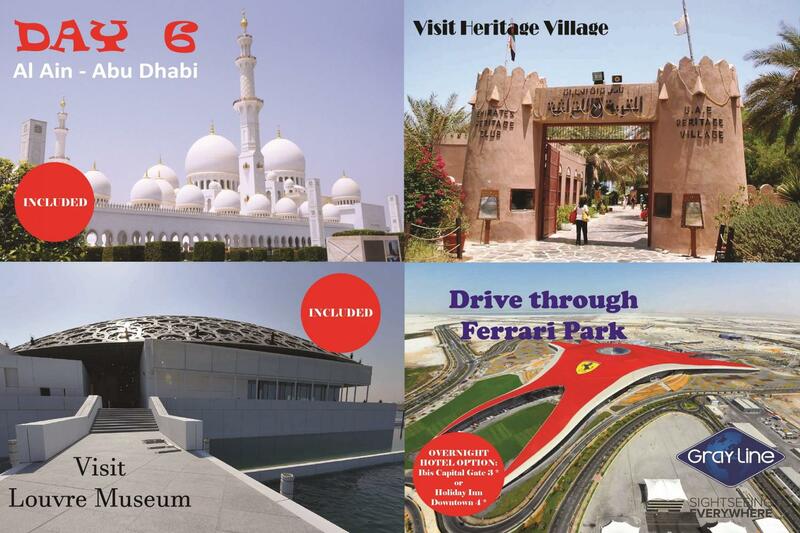 This comprehensive tour is the ideal introduction to the UAE capital and the island on which it stands. The name Abu Dhabi means: “Father of the Gazelle”. Our first stop will be at Sheikh Zayed Grand mosque, one of the largest Mosques in the world; able to accommodate more than 30,000 worshipers. The beautiful Mosque is completely clad in marble and also features intricate Islamic decoration and carvings as well as extensive landscaping works. 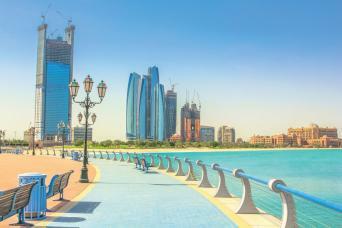 We will continue our tour towards Abu Dhabi downtown. We will then proceed to the Heritage Village, which houses a small museum and depicts the traditional daily activities of the Arab community prior to the discovery of oil. Lunch will be served in a local restaurant or in a Hotel After lunch visit Craft Center Abu Dhabi. In the afternoon, we will drive along the spectacular Corniche, past gleaming white mosques, glass-clad offices and elegant high-rise apartments to the tip of the breakwater for a superb view of the city’s magnificent skyline. The remaining part of the afternoon will be devoted to drive through the famous giant Saadiyat Island project where the GUGGENHEIM museum is being built to complete the image of ABU DHABI as a cultural city. The tour will continue towards to Louvre Museum, the Louvre Abu Dhabi is an art and civilization museum, located on the saadiyat Island Cultural District. We will transfer to famous Yas Island which houses the FORMULA 1 YAS circuit & the first attraction park of Ferrari in the world.An impressive attraction park, the largest covered air conditioned park in the world with a huge RED FERRARI sign as landmark. Dinner in a traditional restaurant to enjoy that last night in the Emirates. Overnight in Abu Dhabi. Breakfast at your hotel. Check out at 1200 Hrs. 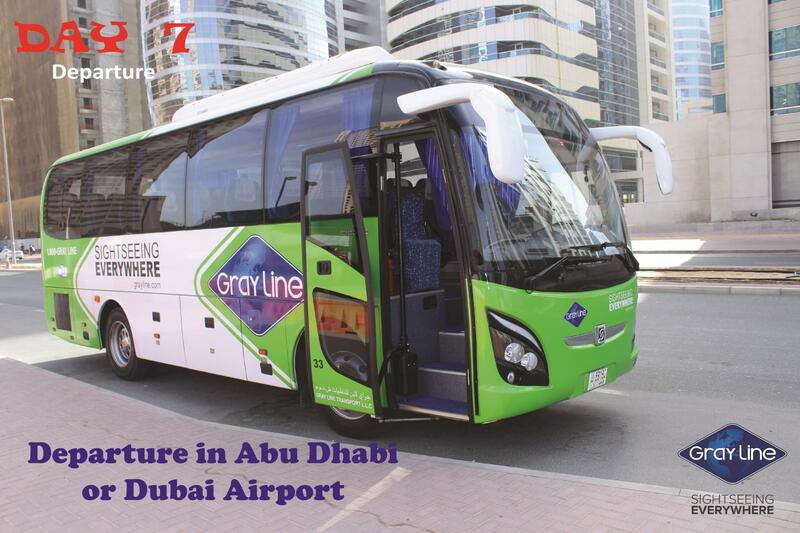 Later during you will be transferred in a comfortable vehicle to Dubai airport for departure depending on your flight details.